The painting you see above sold at an auction in London last month for $432 000. To put that figure in some kind of perspective, $432 000 would be somewhere approaching the median house price in my neighbourhood. So what was so amazing about what looks to be, at least on the surface and to the untrained eye a very minimalist, one might even say rudimentary portrait? It was painted by a computer. Or to be more precise, an Artificial Intelligence (A.I) generated algorithm. Viewed up close, this image cobbled together with 1s and 0s, becomes a grid of mechanical-looking dots, the man’s face a golden blur with black holes for eyes. Created by a Paris collective, a data set consisting of some 15,000 portraits painted between the 14th and 20th centuries were fed into a super computer to effectively teach ‘it’ by example the fundamentals of human portraiture painting. Besides the soulless look and feel of this ‘painting’ the other giveaway that it’s not born of a human mind is the signature of the ‘artist’ in the bottom right hand corner of the work. It took only nine minutes of bidding at Christie’s London auction house for this work to reach the price of $432 000. Creativity is something we have always closely associated with what it means to be human. For decades we have elevated ourselves above the level of mere machines by claiming that although a computer may be able to quantify the size of an atom or calculate the exact distance to the moon it will never, with heavy emphasis on the word NEVER, be able to create a true thing of original beauty like a painting or a music symphony. In the age of Siiri, computer driven cars and speech recognition software, it may just be time to ever so quietly step away from those previously so over-confidently stated assertions. All this brings me in a quite round-a-bout way to what I really wanted to let you know about in this post. Every so often SCENIC WRITER’S SHACK justifies its name choice and talks something about actual writing. This is one of those occasions. Guy was melancholic by nature. As he stood alone and muttering to himself, casting judgement in the floor to ceiling glass walls of the state-funded Petaflops Algorithm Museum of Contemporary Art in downtown Munich – the world’s first gallery devoted wholly to showcasing computer-made art works – the somewhat depressing and certainly off-centre occasion was definitely no watershed moment for him. Beret-wearing Guy was a person comfortable in his own misery, you could tell. He looked and sounded as though he’d been here before. The female security guard had begun staring arrows in his direction and speaking into her secret service earpiece by now. Guy knew it was time to leave. He canted forward with his narrow shoulders hunched, as though heading into a bracing wind and made his way to the lift going to the ground floor exit. On his way out, it took all his will not to shield himself with his hands as he travelled past the elderly reception person he couldn’t be a 100% certain wasn’t a robot. Instead he opted for a signature departure accompanied by one last under-his-breath but still audible critique – “ Flapdoodle I tell you! This goddamn machine art is all bloody flapdoodle! But in an interesting way – I’ll give you that”. Ps. $432 000 might seem like an insane amount of money to pay for a piece of art, A.I or no A.I. but it pales in comparison with the $90 million, that’s right $90 million forked out just last week for this piece of aquatic eye candy. This artwork was done by a human (now 81-year-old British artist David Hockney) back in 1972 and has just set a new record for the highest price paid at auction for a painting by a living artist. Regular readers will know I’ve currently got a thing for swimming pools, having just bought a house that came with one. So I can actually picture this attractive little number decorating one of our bare walls. The beyond gut-bustingly hilarious price tag however is obviously all wrong. In light of my recent spate of extravagant outlays going right back to the purchase of a new Mazda CX-5 back in June, $15 wall art courtesy of the modest opulence of The Reject Shop is much more within my present budget. And I reckon I spied one at that price last weekend in that exact store. And it didn’t look half unlike it’s multi-million dollar royal cousin pictured above. I’ve had wacky ideas before (HERE and HERE ) as to how I could grow this blog. But this time I think I’m really on to something. “That’s what you said last time and nothing changed” a chorus of mutinous whispers I wanna slap hard reply in unison. This time however it’s different. This time I’m using star power. The idea was to choose a mesmerizingly appealing spokesperson for SCENIC WRITER’S SHACK. Someone with the sort of charisma to draw people in like a magnet and in the process elevate this blog to whole new leagues of aphrodisiac-level popularity. You think I’m dreaming? Well yes I am but the good thing about dreams, especially my dreams, is they come with an unlimited budget. This makes it exceedingly easy to attract the type of supreme talent you’re after. Try it yourself some time. Anyone – male or female, an actual person or a character created by that person – across roughly the last 50 years of human history was up for the nominating. With wide open parameters like those I was like a kid in a candy shop though ironically Willy Wonka as spokesperson for SWS wasn’t an idea that got past the initial culling stage (he was definitely considered). Before I unveil the special individuals I’ll be pinning my foolhardy not to mention especially delusional (self-diagnosed) hopes on, allow me to share this gut-wrenching story of heartbreak with you all. It may in part explain why I am once more suddenly motivated in earnest to seek fresh recruits. 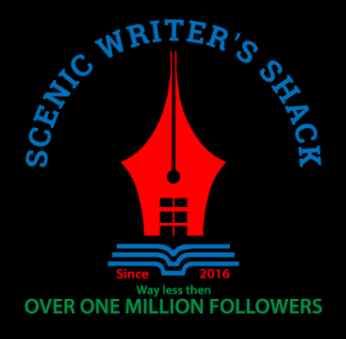 Last Sunday at around 3:30pm SCENIC WRITER’S SHACK had been riding high on 224 followers. 20 minutes later that number had shrunk like the reproductive organs of a male arctic swimmer to just 204 followers. What happened in the interim was that I decided to create a Facebook PAGE. I place the word PAGE in capitals to distinguish it from the more commonplace Facebook PROFILE. There’s a big difference between the two as I’ve now discovered. New rules governing Facebook that came into effect on August 18th this year (following a string of well publicised privacy and security breaches dating all the way back to the 2016 U.S. Presidential elections) mean a person can no longer link other social media platforms automatically to their Facebook account. This means blog entries that were re-posted automatically (provided you had activated that feature in your blog’s settings) with a linked Facebook account (thereby enabling you to reach a larger audience) are no longer automatically able to do that. A person can still manually patch in a link to their blog’s latest post but they now have to remember to do it by hand each time if they want the benefit of the dual audience. The alternative to the manual patch-in is starting up a Facebook PAGE. Facebook PAGES – in contrast to Facebook PROFILES – are intended for people running businesses. Blogs are in effect a person’s own brand, and whether monetorised or not, are also able to be classified for these purposes as businesses. A person is able to activate a setting on their Facebook PAGE so that all their published blog articles are automatically reposted there. This feature, as I’ve explained, is no longer available using a Facebook PROFILE. For some unknown reason up there with the mystery of who built the pyramids and why Sally sold seashells on the beach when people could just pick them up anyway, within twenty minutes (actually it most likely occurred instantaneously but it took me 20 minutes to cotton on) exactly 20 followers (every one of my social media subscribers as distinct from email or WordPress followers) had disappeared from my subscribers list. Even after deleting the jinxed-voodoo-doll-with-a-hundred-rusty-pins-stuck-through- it Facebook PAGE, they have not returned. I crawled across deserts and scaled tall mountains to get those twenty followers. I think you can understand why I needed a decent sized vanilla slice and a couple of musk sticks to console me after the trauma. The nominated spokes-gods – which is what this post was supposed to have been about – have been waiting patiently (and trust me, these are not people used to being kept waiting) in the wings all this time while I’ve been going on about this but a cautionary tale is in essence a community service and so I say ‘Beware of the doe-eyed, innocent-looking Facebook PAGE’ if you already have a blog. And have a good supply of wine gums or other comfort food on hand should you decide to chance your hand anyway after wading your way through this. Apologies to overseas readers who may not be familiar with ex-Wallaby (Australian Rugby Union player) Nick Cummins – more famously known as The Honey Badger. This guy proved he has what it takes in the spruiking department with his one-of-a-kind ‘Tradie’ underwear ads. 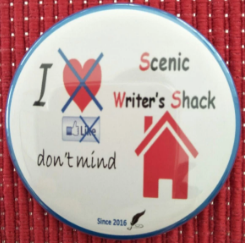 Being the face and voice of SCENIC WRITER’S SHACK would be an easy fit for the loveable larrikin and one which I have no doubt would be within his measure. He may have taken a little flak recently after the season finale of the tv show THE BACHELOR (in which he was first prize) for failing to choose a winner but in my book that was an act of honour. I understand you Nick and you’re definitely ok by me. The type of knock-about free and easy appeal Paul Hogan had for a generation of Aussies’s forty years ago is the same type of charm The Honey Badger offers now. With his sweet and well-intentioned personality and that irresistible ‘down on the farm’ Southern drawl, Huckleberry Hound would make the perfect spokes-dog for SWS. Metaphorically speaking his belt may not go through all the loops, he’s definitely no more than gargled from the fountain of knowledge and the skin tone is not your everyday, but I know when the avocado dip hits the fan and SCENIC WRITER’S SHACK plunges itself knee-deep in controversy, as it seems to do on a semi-regular basis (vanilla slice anyone? ), the relaxed, kindly tones of the blue anthropomorphic dog would be just what the marketing department ordered. I’m pretty sure if ever I hit a sour note on this blog and voiced an idea or opinion that ran contrary to those held by others, all I’d have to do would be wheel out ‘ol Huckleberry playing his guitar while gloriously off-key singing “Oh My Darling Clementine” and all would be forgiven. A bit of gangsta chic might be just the trick to give SCENIC WRITER’S SHACK that hard edge and ‘badboy’ appeal it’s been missing all this time. I could just have easily nominated Al Pacino‘s detective Vincent Hanna character from the same movie since he and Neil are really opposite sides of the same driven, lazer-foccused persona. But mid-nineties De Niro – in THAT suit – is an offer just too irresistible to pass up. I try not to imagine Neil walking away from an offer of a spokesperson’s role for SCENIC WRITER’S SHACK like he walks away in this scene from the one woman (Eady) who promises him a better, more stable and loving future. Well… what else would you expect from a person who moonlights a second blog going by the name of LOST IN SPACE FIRESIDE? Would I hand over the spokesperson’s job to a man dressed in a silver space suit and wielding a laser gun? You bet your sweet intergalactic apple sauce I would! Actor Guy Williams (who was also Zorro in the 1950’s tv series) played the head of the Robinson family for three seasons on the original tv series of LOST IN SPACE and had the type of leading man looks that were standard for the day. When he spoke people, aliens and robots all paid attention. I think John Robinson could have a similar effect here at SCENIC WRITER’S SHACK. 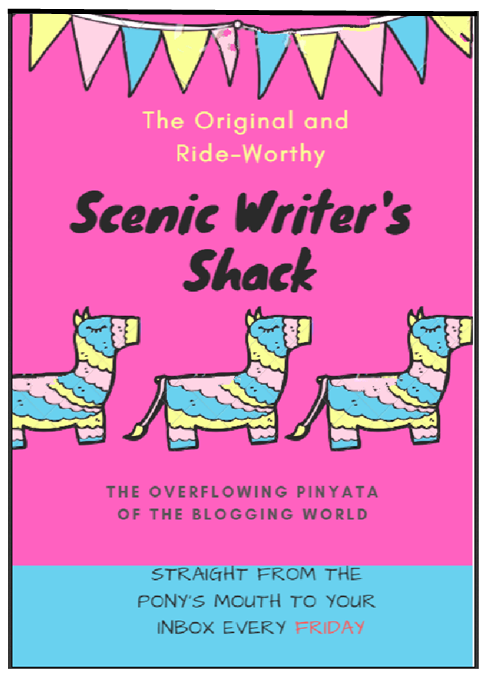 With a name like SCENIC WRITER’S SHACK there had to be at least one genuine writer on the list, right? The author who created James Bond and whose novels have sold over 100 million copies also more importantly was the creator of the seminal children’s masterpiece CHITTY CHITTY BANG BANG. Versatility like that could come in handy if he took on the role of spokesperson for SWS. Of course to be accepted for a glamour gig like SCENIC WRITER’S SHACK naturally he’d have to give up the nicotine sticks first, ’cause that just ain’t healthy. There were a number of other contenders that made the shortlist but sadly didn’t get the final nod for a spot in the Top 5. Those included my mother, wife and daughter, current New Zealand Prime Minister Jacinda Ardern, Ripley from the Alien movies and tennis great Serena Williams. Serena ended up not making the cut due to her sometimes over-forceful exuberant delivery style (and I’m not referring to her tennis serve). Ps. A big thankyou to all the people who sent through kind thoughts and congratulations last week on the occasion of me displaying photos of my new digs. Material possessions do not happiness make (that’s me trying to sound tastefully Shakespearian but coming across more as someone with two left feet as far as English usage goes) but they usually don’t hurt so I’m thankful for what I’ve now got (I’ll be even more thankful when I can actually say I own it rather than the bank owns it). Ok, so that’s not my car and that’s not my pool (and that’s definitely not my crashed through fence) but by golly… someone’s got some explainin’ to do haven’t they? And the saddest part for me as a now clean-obsessed, ever vigilant, algae-killing pool owner is when I look at that picture all I see is the leaves on the surface down one end that will need removing! Pss. With all the hoopla this week surrounding the 50th Anniversary reissue of the Beatles 1968 ‘White Album’ as a remastered, remixed boxset, I thought it timely to revisit my appraisal from June of last year of what some (but not me!) have called the greatest album ever recorded. Pardon me if my exhale came close to knocking you over with its force. What that is is the sound of me finally expunging releasing letting go a huge, well-earned, relieved sigh that the whole thing is finally over. The months upon months of dealing with real estate agents, finance brokers, lawyers, banks, every sub-species of tradie you can name from plasterers, electricians and plumbers to roof tilers, retaining wall builders and glass repairers and at least a dozen guys named ‘Mick’, utility companies, removalist firms, skip-hire outfits that specify ‘mattresses go on top like the last layer of a cake’ and a literal army of other assorted professionals and people that entered our world for the time it took us to look for, find, buy and move into our new house and move out of our old house – that’s what ‘whole thing’. If you happened to have stumbled on this site somehow by accident for the very first time, no, this is not another real estate blog. What this is is Glen unashameably for the first and only time displaying the spoils of his hunt. And my what a hunt it was! Every weekend for three solid months. One firm offer made on a two-story house that fell short because of a last-minute glitch at the finance end. And popping bubble wrap just to relief the stress of it all. In fact an on-line search just now under the heading “Top Ten Life Stressors” puts ‘Moving house’ right alongside divorce, death of a loved one, major illness and job loss. I’ve always thought ‘assembling furniture’ deserved to go somewhere on those type of lists as well but that’s a discussion for another day. I think I’m fairly safe in declaring throughout my life I’ve never been the type of person who’s gone about feverishly trying to acquire ‘status symbols’ in a bid to advertise and elevate their perceived social standing. I will however now allow myself one small concession on that front. I can now officially claim to own a house that is actually big enough and has ceilings high enough to have its own real-life echo. You heard me right. When we are in the main dining area our new house boasts a slightly surreal, cathedral-like, definite echo! I say cool. I also say two thumbs up to that! Probably the weirdest part of this story is that all this effort was expended to move into a house just two kilometres from and in the very same suburb as our old house. Back in primary school I had a best friend whose parents one year did exactly the same thing. I could never work out why someone would go to all the trouble to pack up their worldly belongings only to move a stone’s throw from where they originally were. I’ve waited forty years for the answer to this riddle and it finally came last week – for a better house! Ps. As you can see from the pictures, this new house came with a pool. For a person like me who’s never owned a swimming pool before, the week-long experience of nursing it back to clear and sparkling health – courtesy of $500 worth of serious-sounding chemicals and hired technical expertise to get the salt-chlorinator back on its feet – from the swamp green colour it was on the day we moved in (thanks previous owners!) was something I wouldn’t want to go through again. It’s also comedy/drama-riddled enough to warrant a blog post completely on its own sometime in the near future. There may even be a Powerpoint Presentation.